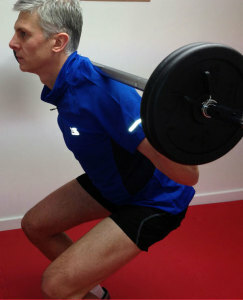 This is a compound exercise which primarily trains the muscles in the thighs, hips and glutes. Stand with your feet hip distance apart, take a football or any ball in your hands. Place the ball to your chest and as you sit back and downwards, push the ball away from your chest in a forward direction. This counterbalances and forces your hips to move backwards. Keep your chest high and look forwards. Keeping your heels firmly fixed to the ground, your knees should not go over your toes. Repeat this a few times to get the form correct and you are ready for any squat exercise. Squat with a barbell resting across the back of your shoulders – by adding weight you will be working several muscle groups. It can help your core strength and improve flexibility, helping to build powerful thighs, a strong lower back and firm abdominal muscles.